The waters of the Verdon River flow into Sainte Croix Lake in Provence, France in Europe. 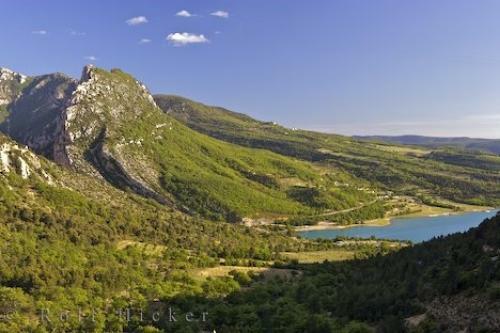 Photo of Sainte Croix Lake and Verdon River in the Gorges du Verdon in Provence, France in Europe. ... Kayaking on Sainte Croix Lake, hiking or cliff climbing across the spectacular landscape are some of the activities for the energetic visitor but the beauty of the deep Verdon canyon and surrounding country of this part of Provence, France is enough for the rest of us.The Verdon River flows into Lac de Ste Croix from the Grand Canyon du Verdon, Gorges du Verdon, Parc Naturel Regional du Verdon, Alpes de Haute, Provence, France, Europe. I photographed this photo with the digital SLR camera model Canon EOS-1Ds Mark II, aperture of f/8.0, exposure time of 1/60 sec. on ISO 100, as always I used a original Canon Lens, the focus lenght for this picture was 42mm.